Whether you like to wear your ponytail high atop your head or low and long, the Ponytail Cuff is a simple accessory that can take your hair from everyday to the fashion runway. No bobby pins or hair stylist necessary. Simply put your hair up in a ponytail as usual using the attached non-damaging hair elastic, then surround it with the cuff and snap it closed. Available in your choice of glossy vibrant colors, the enamel cuff adds panache to your pony and instant style to any outfit. Female testers with hair of varying lengths and thickness put the Ponytail Cuff to the test and gave it high marks any which way they wore it. 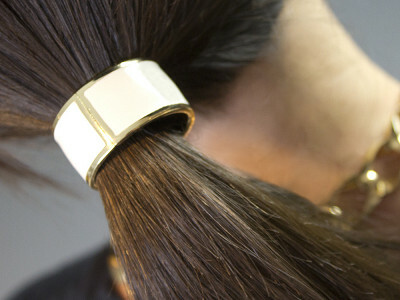 Pony up, thumbs up: How will you wear yours? Whether you like to wear your ponytail high atop your head or low and long, the Ponytail Cuff is a simple accessory that can take your hair from everyday to the fashion runway. No bobby pins or hair stylist necessary. Simply put your hair up in a ponytail as usual using the attached non-damaging hair elastic, then surround it with the cuff and snap it closed. Available in your choice of glossy vibrant colors, the enamel cuff adds panache to your pony and instant style to any outfit. 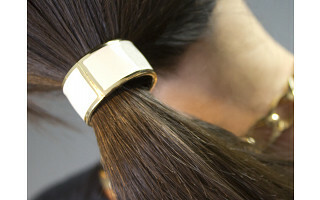 Female testers with hair of varying lengths and thickness put the Ponytail Cuff to the test and gave it high marks any which way they wore it.